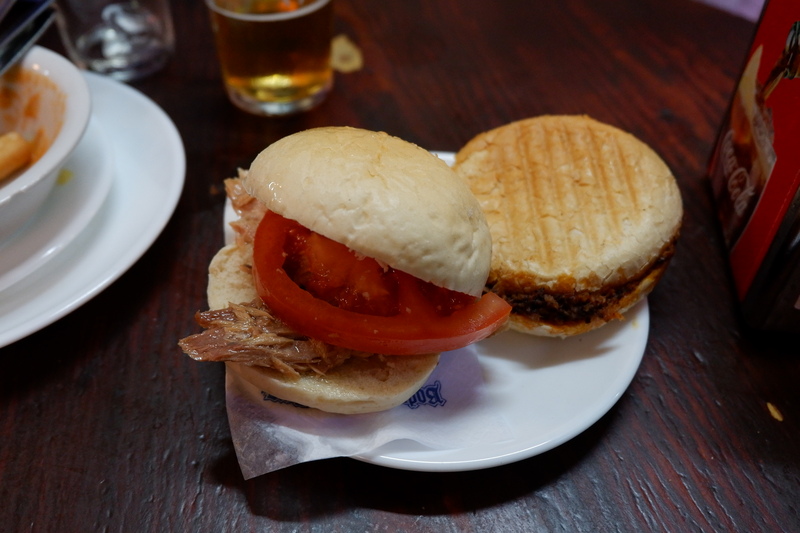 Of course, this should really be called: where I ate in Seville, rather than where to eat in Seville. 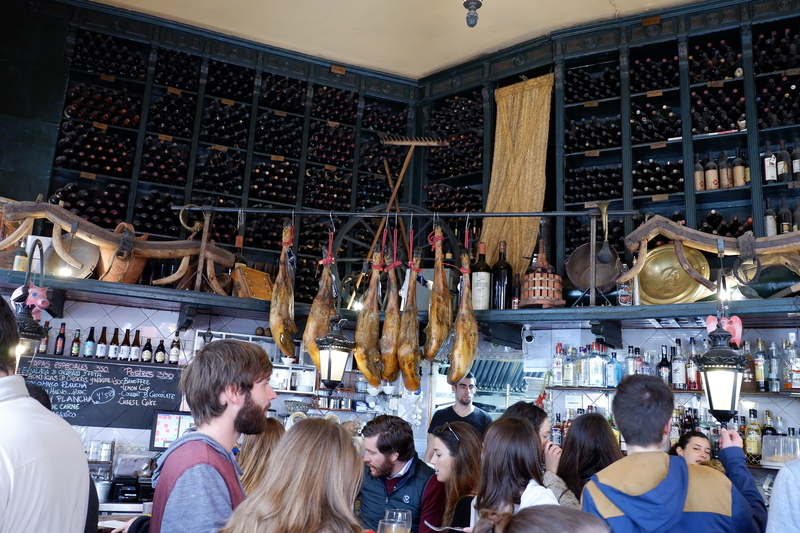 I have not, by all means, tried all (or most) restaurants in the colourful, sun-dappled city and determined with scientific rigour the best restaurants in Seville. Nor have I spent a particular long time here (four glorious days). 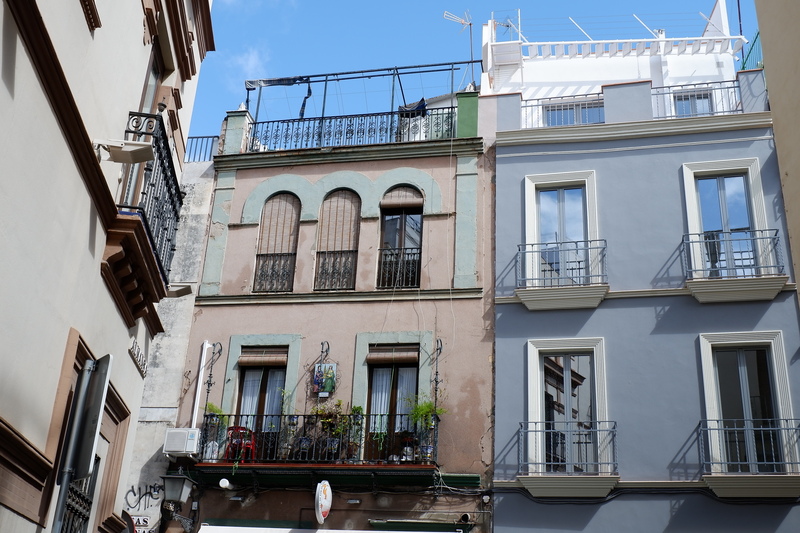 I have however received recommendations from websites and guides and locals alike, and mainly from my sister, who has been living in Seville for the past six months. Here is a list of little gems I have encountered and loved. Bright, simple decor, and traditional food with an inventive twist. The place is popular and had a queue before even opening, mainly with tourists bubbling with excitement. 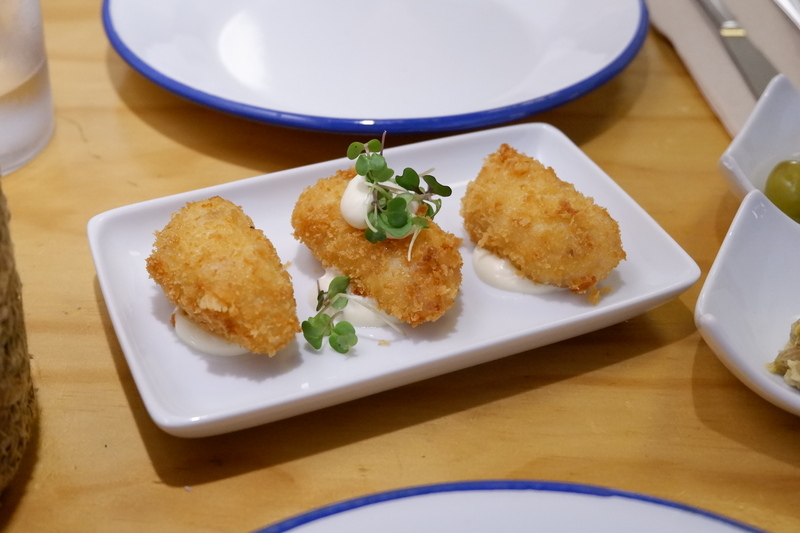 We had jamón croquettes, the filling smooth and creamy if maybe a little too innocently plain, and crispy buñuelos de bacalao, little fried pockets with a fluffy and savoury salted cod filling. 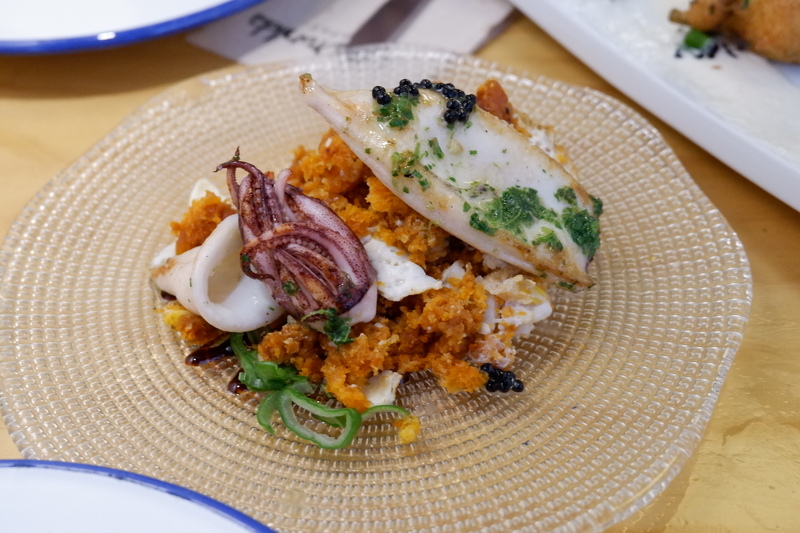 Micas, literally “crumbs”, an Andalusian speciality, came with bright, tender grilled octopus, and a myriad of other ingredients: the bread crumbs were seasoned with scrambled eggs, bits of crispy chorizo, little extravagant pearls of caviar. It may not have been especially clever food, but its simplicity and unfussiness made it a perfect stop for our first lunch. When trying to reserve a table over a week before my arrival, the restaurant was already fully booked. 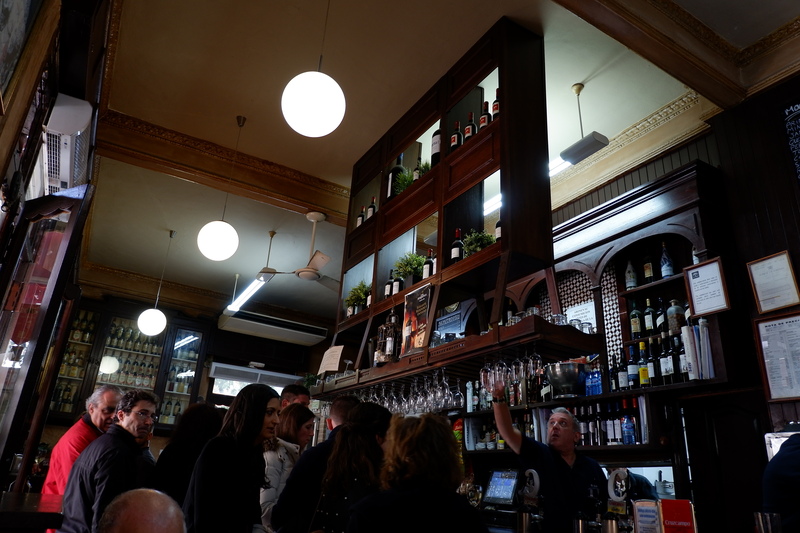 We made our way early (ridiculously early, by Spanish standards), set on getting a seat at the cheaper, less formal tapas counter, but really only managed to conquer a small patch of the restaurant where we ate standing. Eslava is a pretty tapas restaurant, with fairy-tale blue walls which have given every single one of my pictures an otherworldly feel, and a wooden counter decorated with sleek-looking wine bottles (they know how to pick a font) resting in buckets of ice, fresh flowers, jars of clams. 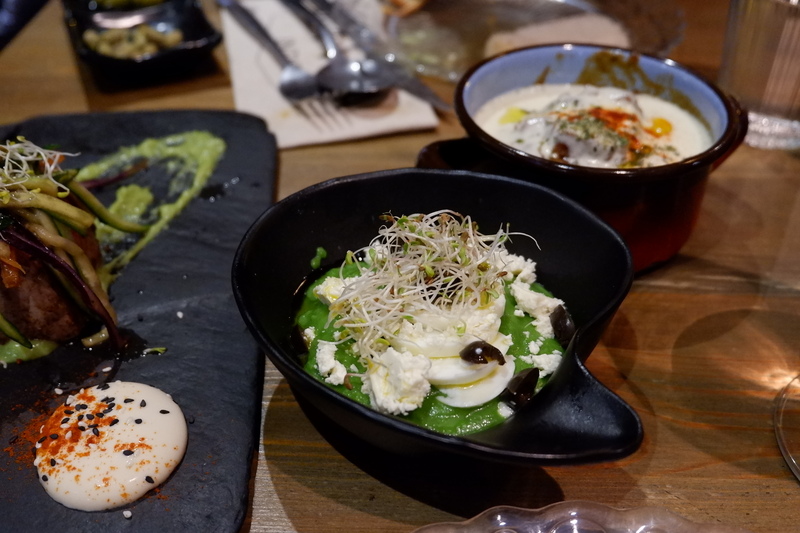 They serve more contemporary takes on Andalusian classics, with food that feels classic but is also a little luxurious and decadent. We started with a slow-cooked egg yolk, sticky and silky, running atop a perfect round of springy bizcocho (a sweet sponge cake) in a dense mushrooms and truffle sauce. They have a very flattering picture of this dish on their website. It was delicious, earthy and sweet, if tiny, but a close-to-perfect morsel of food. 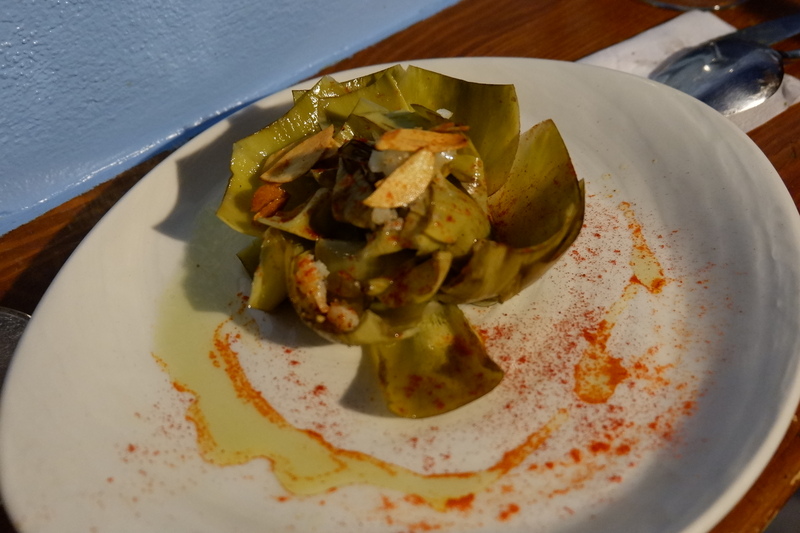 We followed with a whole artichoke, served on a plate like a bloom and dressed with fried garlic. Their signature dish, a cigar shaped pastry which most definitely looks like something else, was filled with some sort of buttery cheese and squid ink filling, so rich it was almost hard to finish, and was maybe my least favourite dish of the evening, although still quite delicious. 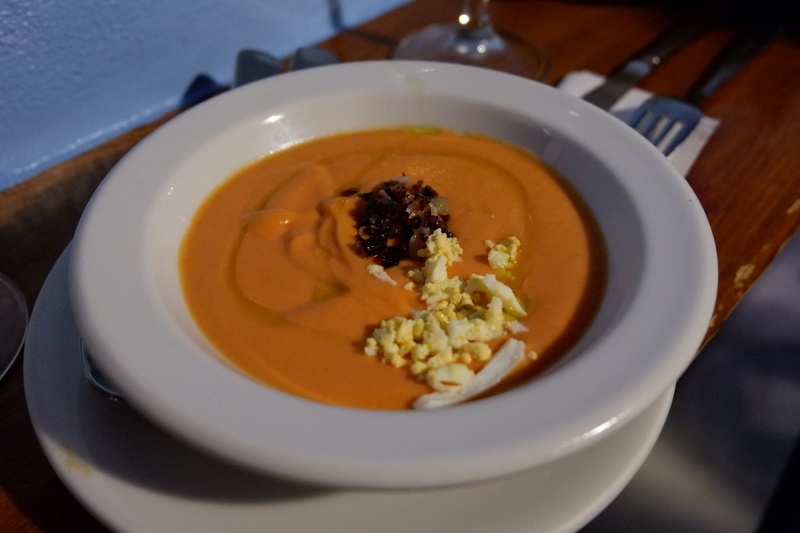 The salmorejo, thick and creamy cold tomato soup, heady with garlic, decorated with chewy-crispy chopped serrano ham and boiled egg, was so addictive I ordered two bowls. We enjoyed a carillada, pig’s cheek stewed in Pedro Ximenez sherry, savoury and fall-apart tender, before deciding we were too full to order the very attractive ribs which seemed to be on everyone else’s plate. When I first walked past this place, it was incredibly busy, buzzing with people spilling onto the pavement, the street, and then the opposite pavement. 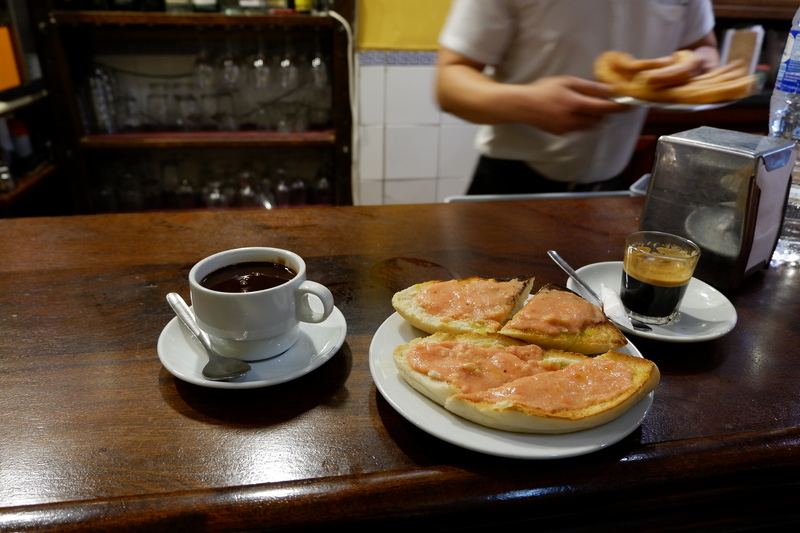 A staple of Sevillan life, it’s a small bodega which serves incredibly delicious, unpretentious, cheap food to hungry people. If you wish to sit down, it’s best to go between lunch and dinner hours, maybe around 4pm. But I think their food is maybe best enjoyed by one of the little tables outside, under the relentless Sevillan sun. This is were I tried my first pringa, which has since become one of my favourite foods in the world. It’s roast pork, slow-cooked with sausage, black pudding and more rendered fat for good measure, cooked until it falls apart and resembled the texture of pâté, and encased in a small toasted sandwich. 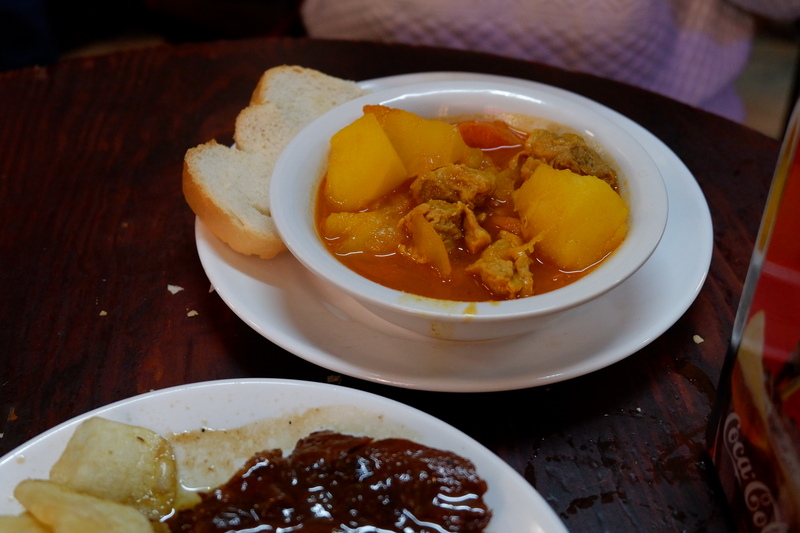 Warm, meaty and savoury, maybe akin to a liver on warm bread but slightly less gamey. 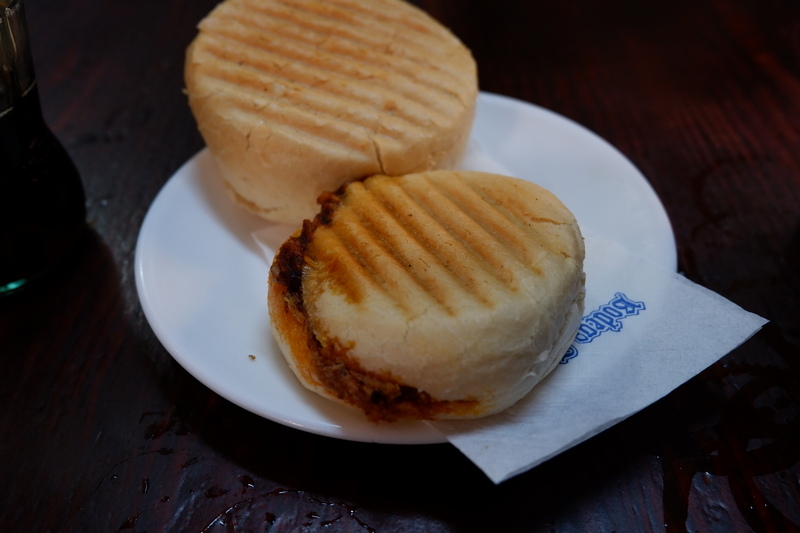 They serve a variety of montaditos, small sandwiches, filled with all sorts of cured meats, cheese and fried fish. 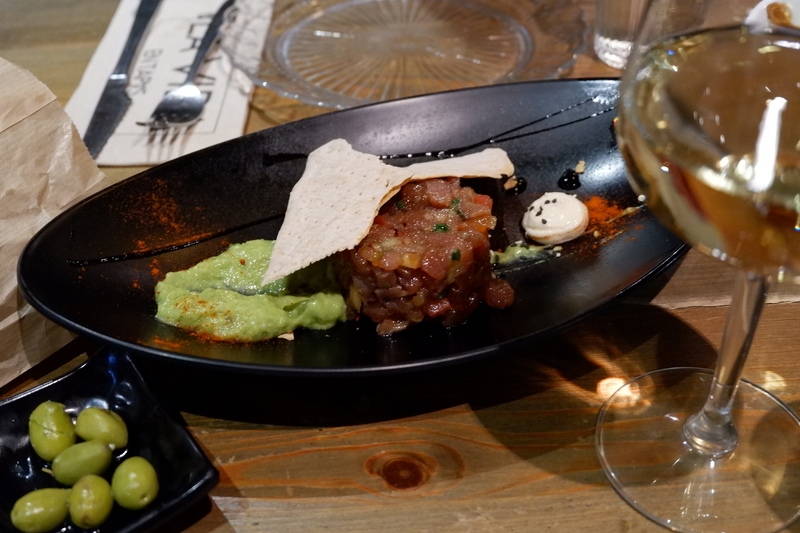 We enjoyed estufado, stewed meat in a bright orange, simple and comforting; a beef filet with stick and almost unappealingly dark pedro jimenez sauce; a montadito with morcilla (black pudding); garlicky, dense salmorejo; a firm, savoury tortilla. Servers are funny, loud, friendly, joking with patrons, screaming “caballero” across the street, writing your orders on the counter in chalk, and will genuinely throw your food on the plate with a handful of crisps or picos and serve you as quickly as they can. It’s not a place that bothers with presentation, but its simple food, and glasses of cold beer, were enough to warm my heart. 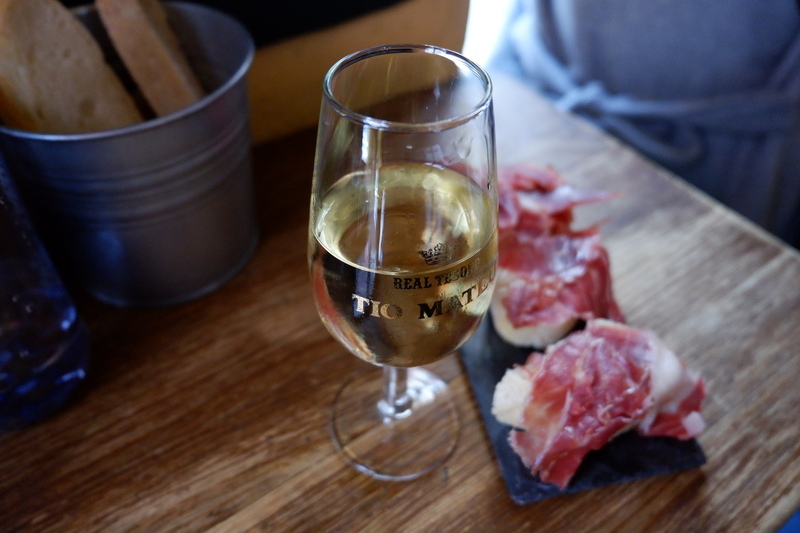 A small, endlessly charming bar, packed with ancient, dusty wine bottles adorning the walls, where I felt very Spanish while sipping on Manzanilla and enjoying some jamón on bread. 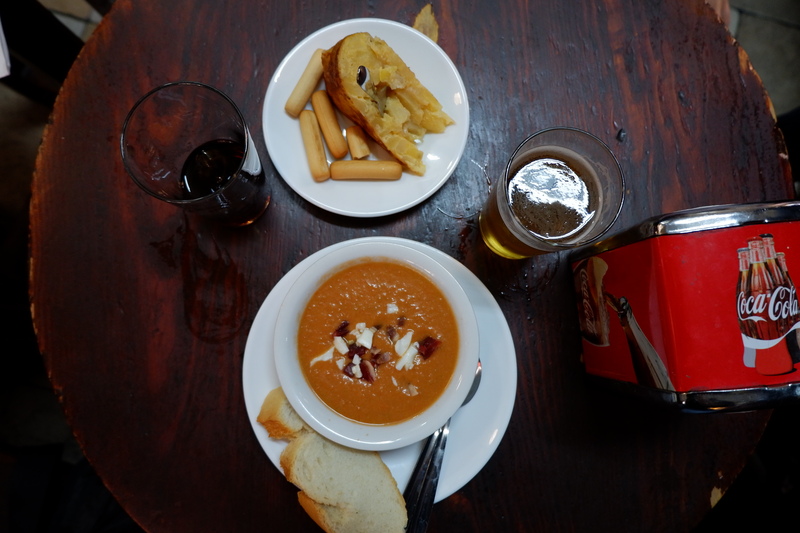 Dúo Tapas, in the Alameida quarter, is proof to me that: 1- Seville does not concern itself with “instagrammability” (yes I hate myself for using that word, too), and 2- Food tastes good even when it doesn’t look good. Maybe even better. Serving tapas with an Asian twist, it’s another busy, lively place which makes Spanish classics contemporary. There was a tuna tartare, glistening pink, served simply with a cracker and some mashed avocado. Funny-looking prawn spring rolls, long and thing with a tapered end, encased in crisp pastry, the filling so delicious and fresh it made me realise I had forgotten what fresh prawns taste like. 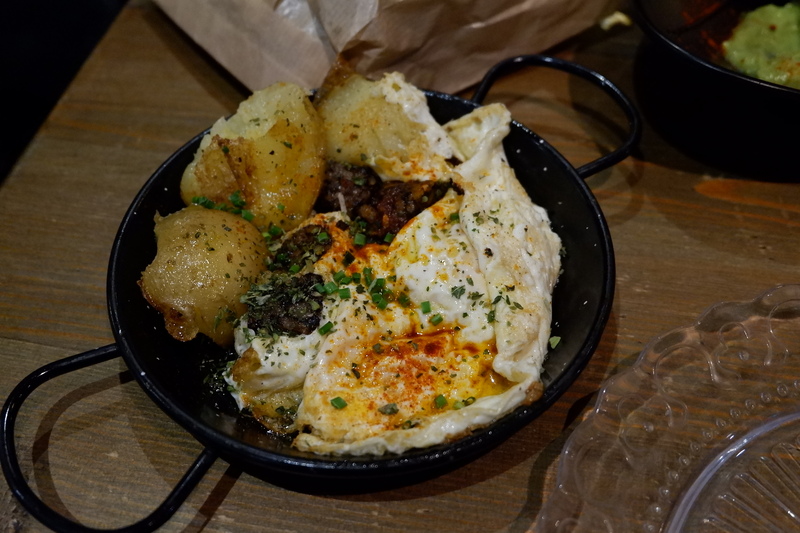 A carrillada in a parmentier sauce, fall-off-the-bone tender; their rendition of the salmorejo, made with green apple and celery, creamy, sweet-tart and refreshing; and huevos rotos, fried eggs which were very much not concerned with the way they looked, a delicious mess of runny yolks and crisped-up whites, chuncky golden potatoes, and thick slices of savoury blood pudding. Which made me wonder, why are restaurants are so shy with blood pudding in Britain? It would be a pretty good addition to any fried egg, even the cookie-cutter prosecco-filled brunch kind, the perfect cloud of white with a shiny round yolk bang in the middle which looks a little like a drawing. In fact, couldn’t we also let our eggs get a little messy? I don’t know how a pile of huge, warm churros to be dipped in a cup of dense hot chocolate passes for breakast, but I’m in. 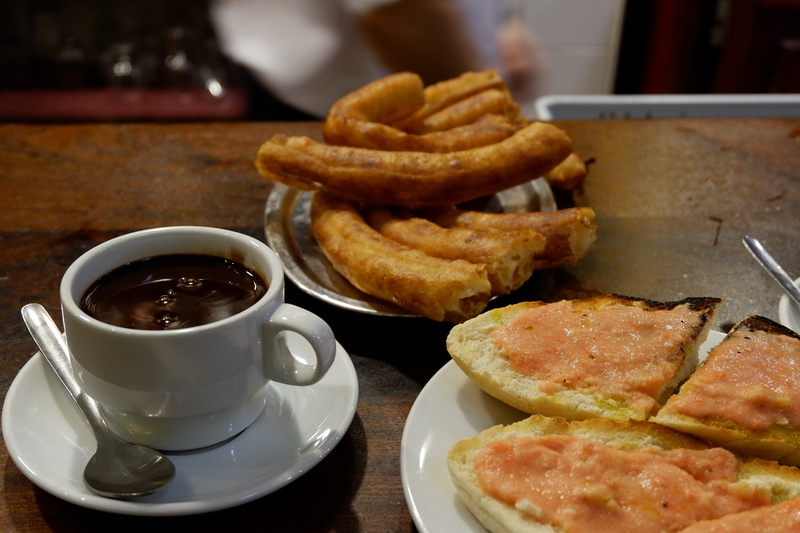 The churros here are delicious but it’s worth popping in for the atmosphere alone, the hustling and bustling behind the counter, elbowing your way to the counter during busy times, and the steaming-hot, crunchy and doughy churros. 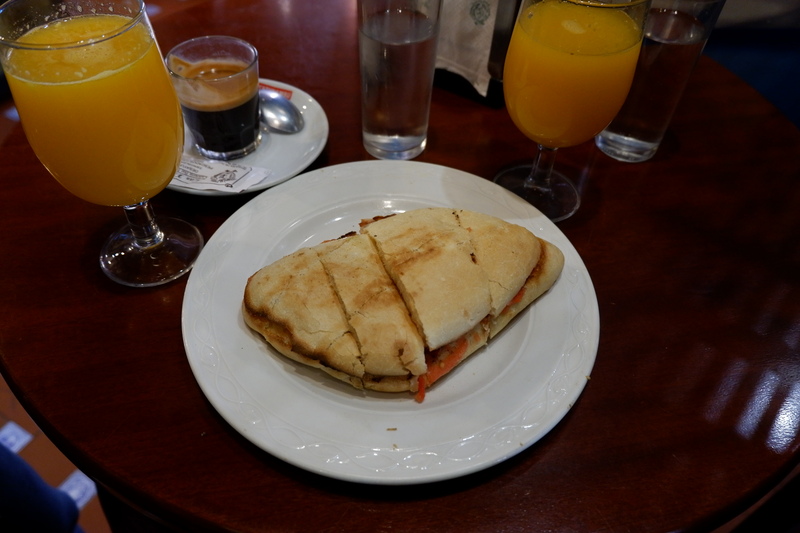 There just is something about Spanish bars and breakfast, but I don’t quite know what it is. A wooden counter, tiled walls, patrons standing at the counter, knocking back their coffee, the noise of spoons clicking against glasses, the swift service. It’s just like nothing else. It made me imagine a life in which I quickly pop to Las Piletas for a tostada con jamón and a cafe con leche before, I don’t know, going to the market and buying beautiful ripe tomatoes. You know, tourist fantasies. Las Piletas is popular for their savoury breakfasts and the pan con tomate was delicious, in itself a perfect example of when a very simple thing becomes much more than the sum of its parts, when those parts are soft, doughy bread; crushed tomatoes; fruity and peppery olive oil. A much more contemporary-looking space (not a tile in sight), white bright blue walls a tropical colour scheme, picture perfect tables and the sort of chairs you’ll find yourself longing for on Pinterest. 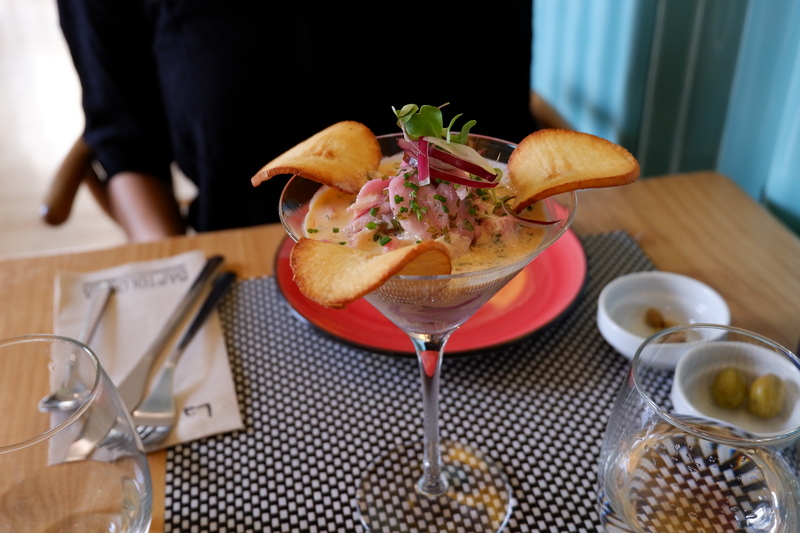 The first dish we tried, a ceviche, came in an over-sized martini glass with yukka chips adorning the rim. Queue to eyeroll (mine). But of course it’s silly to judge its book by its trying-too-hard cover, and the ceviche was delicious, tender but firm chunks of fish in a bright, creamy milk. The dishes that followed all had me considering ordering a second portion. 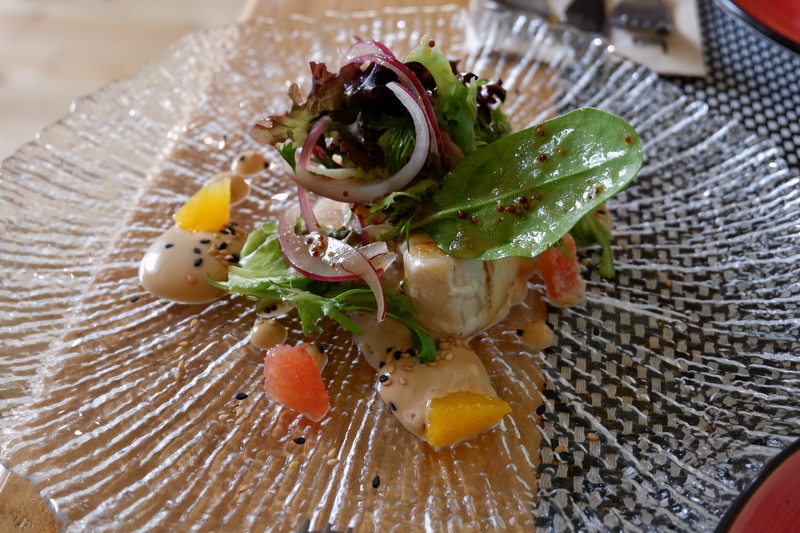 We shared a butterfish tataki, fresh salad piled high on top of the fish, singy chuncks of grapefruit and little pools of soya-flavoured mayo, a roasted note in the savoury, creamy sauce. 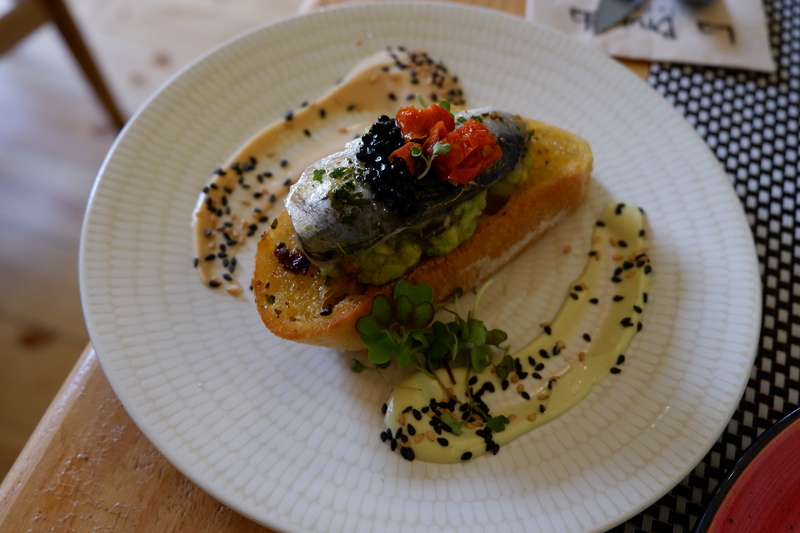 I especially loved the focaccia, with a pillowy layer of their “guacamole”, really a smashed avocado with smoky paprika, a grilled sardine fillet, oily and satisfying, and a delicate garnish of fish roe and sun-dried tomatoes. There was something in the combination of soft springy focaccia and all its layers that made me infinitely happy. It was the sort of dish that you would want to eat every day, all the time. We finished with a dessert. I’m not normally a dessert person. I love pastry and sweets, and have eaten frankly embarrassing amounts of ice cream in my life, but I never really want a heavy dessert at the end of a meal. Their dessert list was enticing enough to challenge my stance and preconception that it’s hard to get depth of flavour with something that’s just, well, sweet. 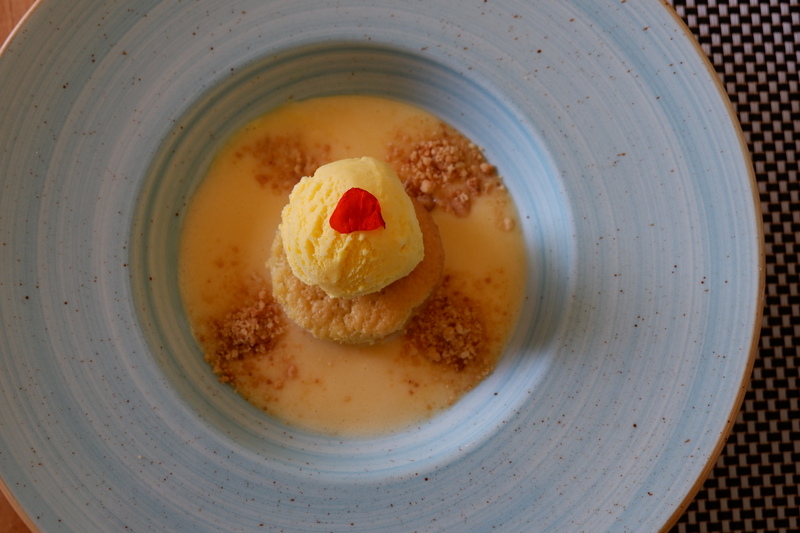 We had ginger bizcocho, soaked in an intensely sweet custard which reminded me a lot of my granny’s egg yolks beaten with white sugar (what passed as a nutritious snack back then), similar to Italian zabaione. And on top, a sphere of saffron ice cream, bright yellow and aromatic with the medicinal sweetness of the precious red stems. 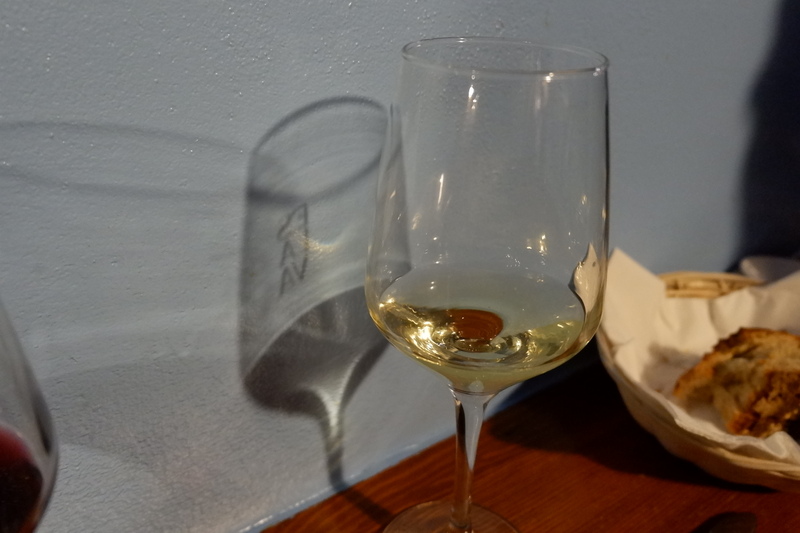 We ate at Bartolomea on my last day – had it been my first, I would have come back. Maybe more than once.